NEW YORK - The American Red Cross mishandled its responses to Hurricane Isaac and Superstorm Sandy in 2012 and often seemed more focused on public relations than on helping storm victims, according to a report from investigative journalism nonprofit ProPublica and NPR published Wednesday, the second anniversary of Sandy. The report cites internal documents and interviews with current and former Red Cross staffers who said the organization repeatedly failed to get relief supplies to people who needed them. American Red Cross spokeswoman Anne Marie Borrego said in an email Wednesday to The Associated Press that the organization disputes many of the allegations in the story. She called it "distorted and inaccurate." According to the story, Red Cross veteran Richard Rieckenberg, who helped coordinate the relief effort in Mississippi after Isaac struck in August 2012, said one Red Cross official gave an order to send out 80 trucks that were empty or carrying a few snacks instead of being filled with meals and basic supplies like diapers. The volunteers "were told to drive around and look like you're giving disaster relief," Rieckenberg said. He said the official who gave the order wanted to impress visiting Red Cross brass. The Red Cross stationed hundreds of volunteers in Tampa, Florida, and kept them there long after it became clear that Isaac would bypass the city, according to the report. The report also found many volunteers used up their available time in Tampa and never did go to storm-hit areas. "After how long they were in Tampa, they obviously could not redeploy," said Bob Scheifele, who helped coordinate Isaac relief in Louisiana. "They consumed all their available time and went home." The Red Cross told ProPublica and NPR that it was responding to early forecasts that Tampa might be in Isaac's path. "The volunteers and resources we deployed to Florida did not come at the expense of other states," it said. The report said the problems continued when Sandy struck the New York-New Jersey area in October. Rieckenberg said that in November 2012, at the peak of the post-storm crisis, 15 emergency response vehicles were assigned to public relations duties while people in neighborhoods like the Rockaways lacked food and drinkable water. Rickenberg said that accounted for 40 percent of the available emergency response vehicles in the state - a claim the Red Cross denies, although it could not say how many vehicles were in New York that day. 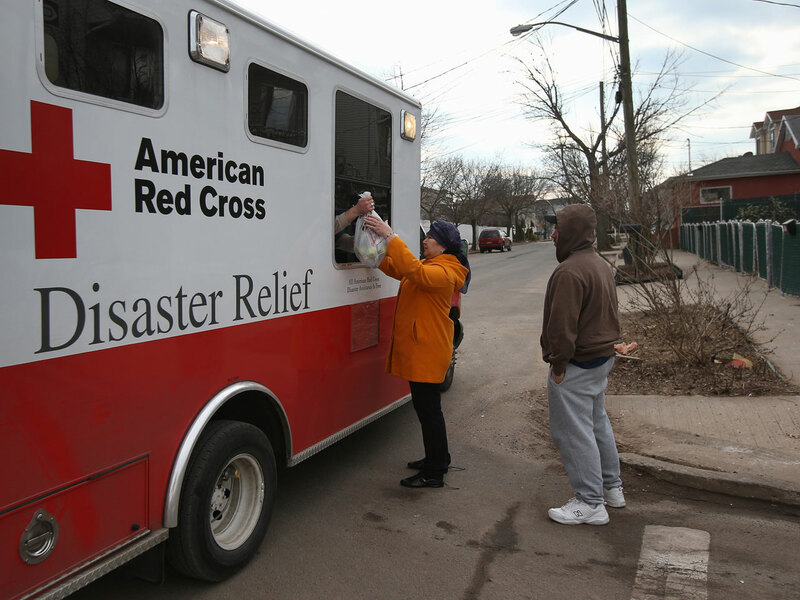 Relief workers from other groups often found the Red Cross efforts in New York to be ineffectual, the report said. Volunteers from Occupy Sandy said one Red Cross truck brought a truck full of pork lunches to a Jewish retirement high-rise. In her email to AP, Borrego said: "It is regrettable that ProPublica and NPR have used the two-year anniversary of Superstorm Sandy's landfall to paint a distorted and inaccurate picture of a Red Cross response that helped tens of thousands of people who urgently needed our services with hot meals, shelter, relief supplies and financial support. Our mission is to alleviate human suffering in the face of emergencies, and that alone is what guided our service delivery decisions during Sandy and during every emergency."